We support the introduction of negative policy rates by some central banks given the significant risks we see to the outlook for growth and inflation. Such bold policy action is unprecedented, and its effects over time will vary among countries. 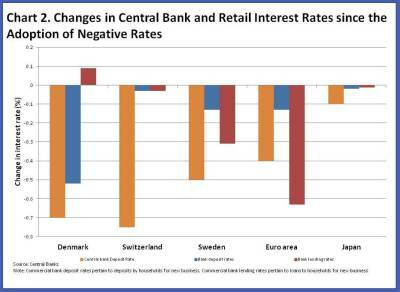 There have been negative real rates in a number of countries over time; it is negative nominal rates that are new. Our analysis takes a broad view of recent events to examine what is new, country experiences so far, the effectiveness of negative nominal rates as well as their limits and their unintended consequences. Although the experience with negative nominal interest rates is limited, we tentatively conclude that overall, they help deliver additional monetary stimulus and easier financial conditions, which support demand and price stability. Still, there are limits on how far and for how long negative policy rates can go. 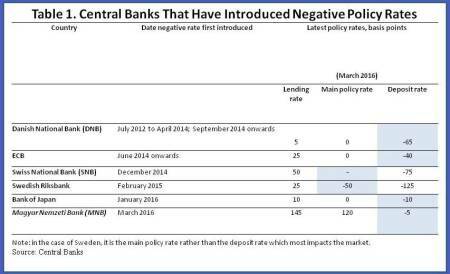 Why are central banks using negative policy rates? 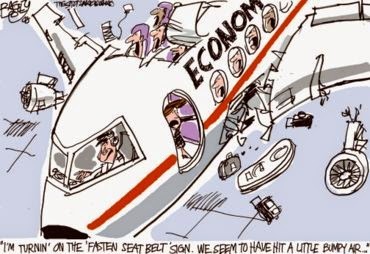 Once policy rates are cut to what used to be known as the ‘zero lower bound’, central banks can employ unconventional monetary policy measures to provide further stimulus if real interest rates are still above the levels consistent with price stability and full employment. Negative nominal policy interest rates are the latest addition to this unconventional toolkit. 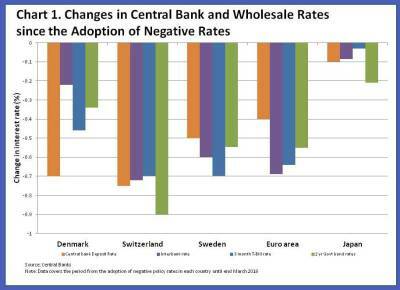 Six central banks so far have introduced negative rates that apply to some amount of the cash balances commercial banks hold with the central bank (Table 1). Negative rates aim to encourage the private sector to spend more and support price stability by further easing monetary and financial conditions. For smaller open economies, negative rates can also help discourage capital inflows and reduce exchange rate appreciation pressures. There are synergies between negative policy interest rates and quantitative easing. Negative policy rates have thus far been associated with expanded central bank balance sheets as a result of quantitative easing or large-scale foreign exchange purchases. Quantitative easing compresses yields and term premia, though it has some limits since over time it reduces the availability of assets for further purchases by the central bank. Moving policy rates negative aims to lower money market rates and push down the yield curve further, and boost portfolio substitution effects, thereby increasing the potency of monetary policy. In fact, negative deposit rates tend to have more bite when a large amount of commercial banks’ reserves are priced at the negative rate. Negative real rates have been seen in both advanced and emerging markets and developing economies when inflation is higher than nominal interest rates. It is negative nominal interest rates that are new. When nominal rates become negative, the transmission mechanism of monetary policy may also differ as there are non-linearities associated with the downward stickiness of retail deposit rates. The latter are unlikely to fall below zero as retail depositors could switch to cash to avoid the negative rate. There are several transmission channels of negative rates: through portfolio rebalancing, bank lending, and via the exchange rate. The portfolio balance channel appears to have operated normally at negative rates. Wholesale interest rates have fallen with central bank deposit rates (see Chart 1). Money market trading activities appeared to have declined, but it is not clear whether these effects reflect negative rates per se, or the substantial surplus liquidity associated with quantitative easing that reduces the demand for trading. Lower risk-free wholesale rates have tended to encourage investors to switch from low yield government securities to riskier assets such as equities, corporate bonds, or property. In addition, lower wholesale interest rates have reduced the cost of funds for those borrowers such as large corporates who can directly finance in commercial paper and corporate bond markets. The impact of negative rates on bank lending has differed across banks, reflecting different funding models and lending practices. While wholesale bank funding costs have fallen, decreases in lending rates have been limited by retail deposits remaining anchored at zero or above. Banks that rely more heavily on customer deposits for funding have hence been less able to reduce lending rates. In most cases, lending rates have fallen since the introduction of negative policy rates but there is a wider dispersion of experiences compared to wholesale markets. Some retail lending rates have even increased somewhat (see Chart 2). Lending rates have tended to fall more in banking systems with a higher proportion of variable rate loans, shorter loan maturities, or high levels of competition among banks. This explains why corporate loan rates appear to have fallen further than retail rates, in part reflecting a greater prevalence of loans indexed to the interbank market. In terms of lending volumes, while it is too early to draw definitive conclusions, credit growth in the euro area for example, has picked up since the introduction of negative rates. Banks benefit overall from policies that support price stability and growth, through stronger borrower creditworthiness, lower nonperforming loans, reduced provisioning costs, and capital gains on the securities they hold, and those more reliant on wholesale funding have seen a reduction in costs. Yet banks’ net interest margins appear to have been squeezed by the combination of negative rates and quantitative easing, although this pressure has been offset to some extent due to a number of mitigating factors. Some banks have been able to raise alternative sources of income through fees or commissions. Many central banks have exempted a portion of commercial bank balances held at the central bank from the negative rate (the so called “tiering” system) thus reducing any potentially perverse impact on bank margins. The impact of negative central bank rates on the exchange rate has been mixed. Portfolio rebalancing in some cases has led to cross-border capital outflows and exchange rate depreciation. In some cases central bank actions have had the beneficial effect of reducing capital inflows (for example in Denmark) while elsewhere other factors have driven the exchange rate. Ballpark estimates by staff for the tipping point at which a move into cash would become worthwhile range from minus 75 basis points (bps) to minus 200 bps. 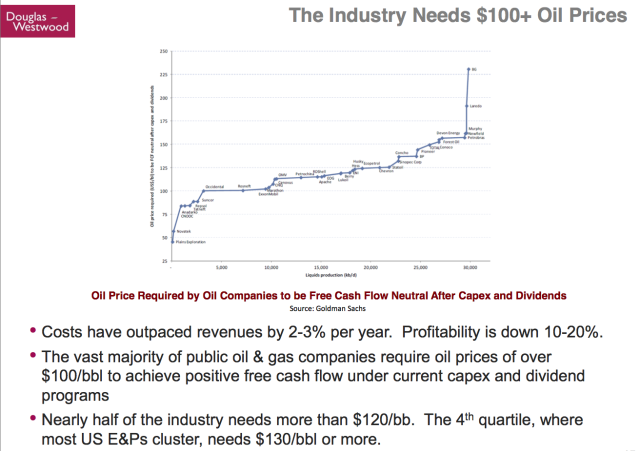 Some of the costs of using cash as a store of value, or for large-value transactions, are of a one-off nature: these might include expanding vault capacity, transporting cash to private sector vaults, and setting up systems. Since these one-off costs would be spread over time, the length of time for which negative rates were expected to endure would be important both in the decision of whether or not to undertake them, and for the interest-rate equivalent added cost to transactions. The tipping point will likely vary by country. It would also be influenced by the value of the highest denomination banknotes. The physical space required for storing US$1 million equivalent would be similar in Denmark, Hungary, Japan, and the United States; but lower in the eurozone and Switzerland where there are higher denomination notes (EUR 500 and CHF 1,000). 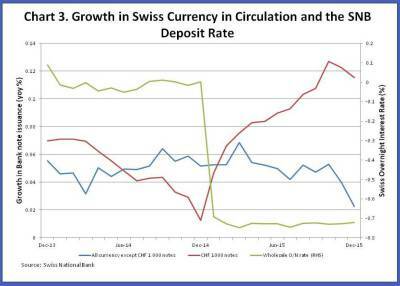 There is some evidence of the demand for large value notes increasing in Switzerland already (see Chart 3). But perhaps more important than the physical limits as described above, there may also be significant political economy and social limits to the use of negative nominal interest rates. The public may feel that they are being “taxed” if and when deposit rates increasingly turn negative. As a result, public support for the negative interest rate policy could be weakened. Commentators have focused on the potential negative impact of negative rates on bank profitability. Banks appear to have been unwilling or unable to reduce retail deposit rates to negative territory, and their net interest margins may have been squeezed. Overall, as mentioned before, to the extent that negative interest rates help to support domestic demand, banks are likely to benefit through improved credit quality, reduced nonperforming loans, and increased loan demand. They may enjoy capital gains on their bond holdings. Admittedly, for banks that are unable to generate greater earnings by increasing the volume of their lending, or by charging fees to depositors, negative rates could be a significant profitability challenge. Another concern is that if policy rates remain negative for too long, there could be increasing spillovers to savers, with negative social consequences, although this is true also of low, positive rates. If low or negative rates persist, they could undermine the viability of life insurers, pensions, and savings vehicles. Low rates make it difficult for insurers to meet guaranteed returns, and with substantial duration mismatches, this will eventually force losses on life insurance policy holders. There may also be excessive risk-taking. As banks’ margins are squeezed, they may start lending to riskier borrowers to maintain their profit levels. Banks may also be encouraged to rely more on cheaper but volatile wholesale funding sources. Weak loans could become harder to detect, and vital corporate restructuring could be delayed. 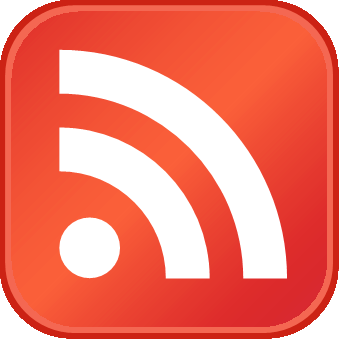 Negative interest rates may induce boom and bust cycles in asset prices. These potential risks require close monitoring and supervisory scrutiny. Prudential authorities may need to respond with stronger policy actions. Although the experience with negative nominal interest rates is limited, we tentatively conclude that overall, they help deliver additional monetary stimulus. Wholesale interest rates have fallen as have some bank lending rates, which should help support demand and price stability. Still, it’s important to emphasize that, while monetary policy is critical to the battle against weak growth and deflationary pressures, there appear to be limits on how far and for how long negative policy rates can go. This underscores that monetary policy cannot be the only game in town. It should be part of a balanced and potent approach that also includes well-designed structural reforms, growth-friendly and supportive fiscal policies, and prudential policies that enhance the resilience of the financial sector.